No. 5 Stanford sailing cemented its utter dominance of the Pacific Coast Collegiate Sailing Conference with wins in the coed fleet race and team race championship events last weekend. 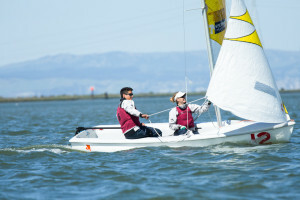 Sailing out of their home venue in Redwood City, the Cardinal were close to perfect from the start when they began the fleet racing event on Friday. Senior skippers Kieran Chung and Hans Henken and their crews senior Haley Kirk and sophomore Nikki Obel did not lose a single race in the 15-boat event, starting a streak of 14 straight wins that effectively clinched the event right from the opening horn. Juniors Antoine Screve and Axel Sly took over for Chung and Henken on the second day, contributing seven more top finishes and landing just twice outside the top three as Stanford demonstrated its depth as it coasted through the finish line. “It didn’t go perfectly, but it was pretty close to it,” said Cardinal head coach John Vandemoer. The win marks the sixth straight year that the Cardinal have won the conference coed championships, a streak that demonstrates just how untouchable Stanford has been on the West Coast in recent years. It also qualifies the team for the Coed National Championships on May 29-31, where the Cardinal will be a favorite to take home its first national title in program history. On Sunday, the team switched to team racing, a format in which each school races each other in a round robin vying for a spot in a championship round. The Cardinal, again, were spotless. The team went 11-0 over the day and took the top two places in every single six-boat race it sailed. In a racing type which emphasizes sailing both quickly and defensively, this level of dominance is extremely rare, and the Cardinal simply looked a class above their opponents as they were never even slightly threatened. Chung and Henken were again critical to the Cardinal’s effort, this time joined by Screve for most of the weekend as Stanford’s group of three boats took race after race. Freshman Will LaDow also saw some action toward the end of the day, and important performances were put in by crews Kirk, Obel, sophomore John Cannistraro and freshman Sammy Steele. Like the fleet race event on the previous two days did for its national analog, this one-day regatta qualified Stanford for the collegiate team race nationals. The team’s victory also represented the eighth consecutive year in which the Cardinal have won the conference championships in team racing. The Cardinal finished third at the team race national championships last year and appear well-positioned to meet or improve on this high-level performance. Stanford will take a bit of rest next weekend as the team hosts two different alumni races at its sailing center in Redwood City. The rest of the season will be dedicated to practicing up for stiff East Coast competition at the various national regattas in late May and early June. Contact Andrew Mather at amather ‘at’ stanford.edu.